This great volume catarmaran has large saloon with great galley. The Starboard side has a big double cabin with walk through to an additional single berth. Shower and head in the aft. On the Port side another large double berth with walk through to head and shower. In the aft cabin there is another double berth. She is fitted with twin 35 hp Perkins diesels shaft drives. 2 x 300 L Fibreglass tanks. 50 L upright fridge, 80 l ice box in cockpit. Top load 25 L in galley. Tudor gas with 2 burners and grill. Micro wave. 2 part of heads port and starboard. Electric anchor winch, sand and plough anchors, 50 m chain, fenders and lines. 4 life jackets, EPIRB, 2 fire extinguishers, 1st aid kit, torch, fire blanket. 6 x 105 amp batteries. 900w of solar, 4 x 200 w, 2 x 50 w, shore power rigged. Course master 750 Auto Pilot, Nivico depth Sounder, GME VHF, Samsung tablet with Navionics. Boat Mooring hook 2, Boat ladder. 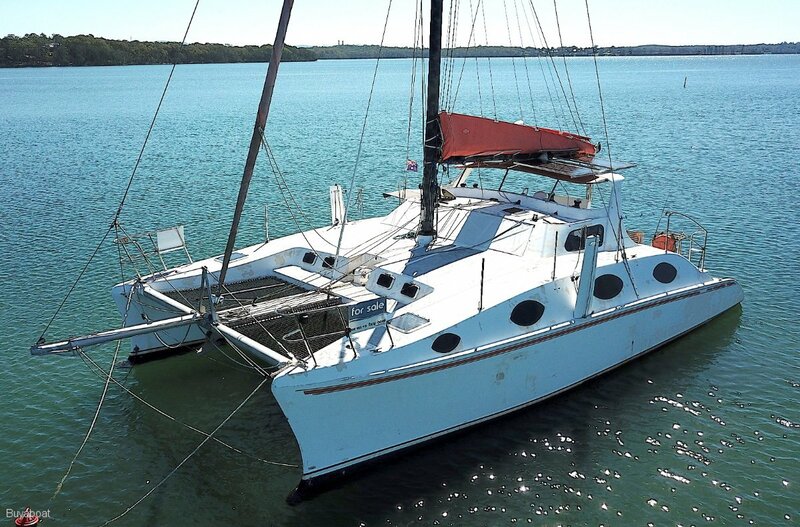 A very roomy catamaran, needs some paintwork repairs, but is well designed and roomy.